Art of Transit: LA 2024 — the committee overseeing the bid to secure the 2024 Summer Olympics — recently issued new renderings of proposed sports venues. The Sepulveda Basin facilities would be easy to reach via the Orange Line while the facilities in Long Beach would be a pleasant stroll from the Blue Line. The International Olympic Committee will decide between L.A. and Paris in September. It’s rumored that the IOC will give one city the 2024 Games and the other the Games in 2028. That would make sense at a time when the number of cities vying to host the Olympics has declined due to the expense and risk involved. Also, IOC delegates will be in L.A. next week to check out our region. So will a lot of press. It will be interesting to see if they see our region as we do. What do you expect them to see, people? Canoe slalom at Sepulveda Basin. Shooting sports at Sep Basin. Triathlon and swimming in Long Beach. Sailing at Long Beach Pier. BMX and water polo in Long Beach. Top spot for ex-Angelenos: in state it was San Diego and out of state it was Las Vegas. One colleague mentioned maybe those most likely to ride transit are moving away from our region, thus the transit ridership declines of recent years. Hmmm. I’m not buying it. FWIW, transit ridership in S.D. and Vegas (along with many other regions in the U.S.) has also declined in recent times. Some high-ranking bullet train officials have stepped down in recent months. How to view it? Supporters point to others who have remained, critics say it’s a sign the project is in trouble. One thing indisputable: more $s are needed to build the train from S.F. to L.A.
…as a way to pay for his infrastructure plan that has yet to officially burp forth. California Gov. Jerry Brown just signed a bill that will raise the gas tax 12 cents a gallon in the Golden State beginning Nov. 1 to pay for road repairs and transit improvements; the vehicle license fee will also increase in 2018. Gas is already expensive in California due to the special blend used here (and other factors, including our dependence on driving). A state + federal increase may prompt some car shoppers to veer from the Gas Hog aisle back to the Something More Reasonable aisle. Salaries can top $100,000, btw. Car manufacturers can’t sell pricey cars that no one knows how to fix. Zine issues a number of complaints: music being played too loudly, the amount of time it takes to transfer to the subway, garbage on the floor of the train, lack of police on the system and the new parking fees at NoHo Station. One addendum: Red Line trains leave NoHo about every 10 minutes until after 8:30 p.m.
Not really related: in other city of L.A. political news, Mayor Eric Garcetti’s name found its way into an NYT story about potential Democratic candidates for U.S. president in 2020. Garcetti will take his second turn at the helm of the Metro Board beginning July 1. 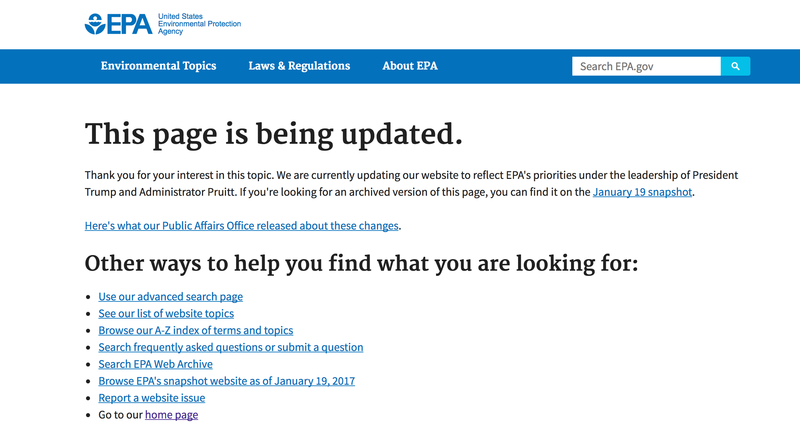 I personally think they should have just left the page up and added a note saying “current EPA leadership disagrees.” I think that’s more honest than hiding facts or scientific views. Here’s the thing with global warming: no one really can say what the impacts will be. The whole point is knowing that something is likely changing and it has the potential to greatly alter ecosystems that we depend on and care about. Providing that information allows individuals and governments the freedom to make their own choices about what, if anything, they want to do about climate change. My personal view is that we should seek to mitigate what changes we can and that it’s worth the effort to protect the biodiversity that thus far has helped sustain us. It’s also worth noting that many agencies already have made their choices. Metro does try to reduce its energy use and greenhouse gas emissions to the extent possible (our Climate Action Plan is here and embedded below). As part of our PR and marketing effort, we also remind people that generally speaking taking transit, walking and biking instead of driving alone will help reduce greenhouse gas emissions. More about that here. That messaging is not going to change. The idea was to be a transit-version of Uber — routes would change based on demand. The transit agency in K.C. tried it and…pssst. Problem is, it’s hard to out-Uber Uber. It would be nice to see more officials follow Dennis Zine’s example and take transit. It does no good to pump massive amounts of money into infrastructure if penny pinching takes over when it comes time to maintain the system. The system must be frequent, safe, clean and reliable or people will not use it.